Palm Desert beautiful communities in the desert. This beautiful city is nestled in a central location within the Coachella Valley. Palm Desert provides a central location conveniently close to shopping, parks, schools, colleges and restaurants. 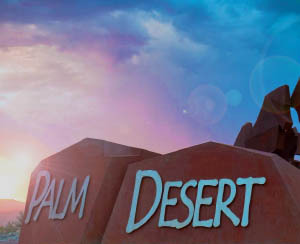 Palm Desert’s famed El Paseo has high-end shopping and world class dining experiences. This popular “haven” for those seeing refuge from colder climates Palm Desert offers home buyer options for second homes and permanent homes alike. In recent years Palm Desert has seen more and more full-time resident from costal cities and Southern California urban centers due to the relative affordability of single family homes available. New home sale only! Contact one of our highly knowledgable real estate agents who can help you right away – here.